i spent today at Kingsoak Primary Learning Centre in Wombwell, Barnsley. It was actually the second of two days in this big, busy, lovely school. Over the two days I worked with all of KS1 and all of KS2 and read poems to everyone, including F1 and F2, in my opening assembly yesterday.. In the workshops we wrote loads of MONSTER poems, UFO poems, PIRATE poems and PLAYING TIG poems and had a very very very good time. Everyone at the school is SO friendly and worked so hard. The grown ups are great and helped me a lot when I was working with the children. The boys and girls did a lot of poetry AND a lot of laughing!!!!!!!!!!!!!!!! And the teacher who asked me along, Mrs.Smith, had worked very hard and organised a poetry competition, so each class in the school learnt a poem and performed it. There were two slams and I had to choose two winners which was, as you can imagine, impossible….IMPOSSIBLE!! In the first slam i chose Y5 because they did a very lively version of a Spike Milligan poem about the Ning Nang Nong and during their performance, they had all sorts people jumping up and down in unexpected places making noises, which made it exciting to listen to and watch. They came just in front of a very very good Y2 performance. And Foundation stage won the second slam because they performed a long version of Twinkle Twinkle Little Star with lots of group voices and very confident solos and some triangles too! But all the classes were great. Everyone performed their poems with a high energy and huge confidence and did some great bits of acting-out, often with props. A very impressive set of performances. Above all, the children of this school now have learned some excellent poems (three were written by me so of course I thought they were excellent!) by heart AND all of them stood up in front of an audience and made their poems come to life. And of course everyone today, all the grown ups and all the kids, were dressed as their favourite book characters. Thank you for a fabulous two days! I was asked to visit this WONDERFUL school on the 23rd of February and to work with the classes in KS2. Everyone at this school was just so very very friendly, warm and welcoming. The girls worked very hard indeed, writing poems on their own or sometimes doing that and then making whole class performance poems. In Y5 the girls wrote poems that made a type of weather into a person, based on my poem Frosty Pinchface. That is a hard idea to understand but all the Y5 pupils grasped it straight away and wrote really exciting poems, giving their weather character invented names. I especially liked Tina Tornado! The other classes wrote about crazy zoos and UFOs bursting with aliens. A lovely lovely school and I had a really enjoyable day. Great fun. This is another Very Favourite School To Visit. I was here last year and was invited again in early February. I worked with the KS2 classes and we made poems about pirates and giants and animals and UFOs and then had a big shout-out sharing of poems at the end of the day. It really was lovely to be asked back for a second visit and I had such a great day in this wonderfully warm and welcoming school. This is one of my favourite schools which I visit quite lot. Over a couple of weeks, Y5 and Y6 worked very hard writing many different poems and then collaborating in groups to write big performance pieces. The children had to concentrate a lot and had to work hard because there was a lot to do and only so much time available. Everyone was very pleased with what was made.The results were great, really exciting stuff! In January I visited Norton Infants School in Doncaster, had a great day and really enjoyed myself. I had met all the lovely teachers before because I helped with a Training Day and of course, I met all the other lovely grown ups too. The boys and girls had a fun time making up big poems and performing them. So, thank you everybody at Norton Infants School! 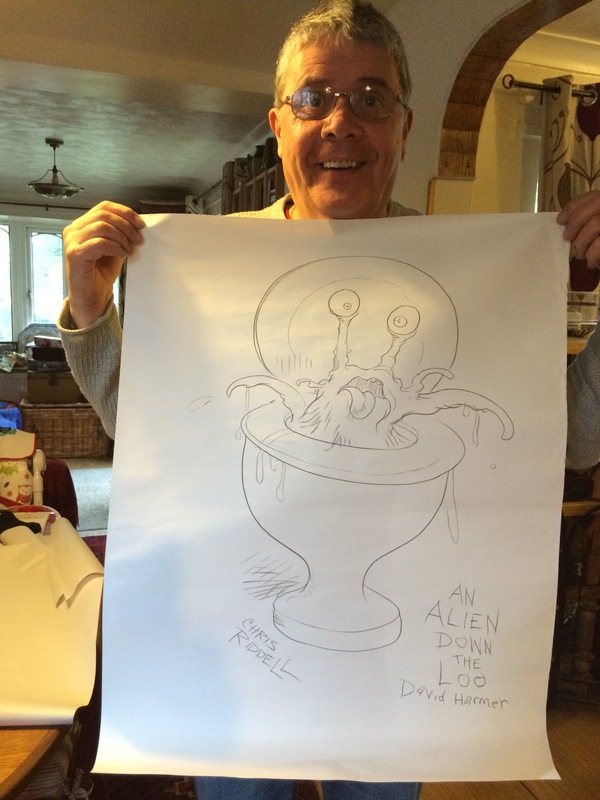 This is the drawing Chris did was I performed my poem There’s An Alien Down The Loo. A wonderful moment, to turn round and see him drawing as I jumped up and down looking for aliens!